Description: Colt Python Double Action Revolver serial #88765E, 357 Magnum, 4" barrel with a bright excellent bore. 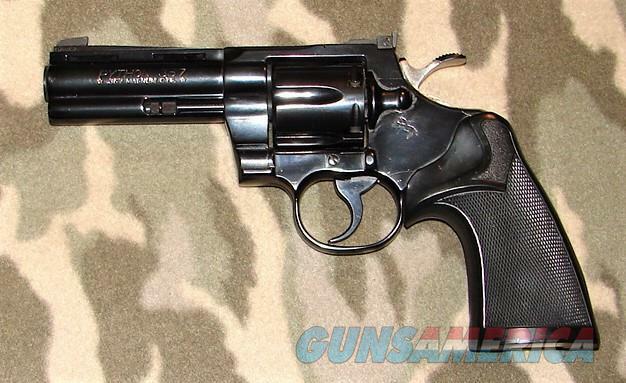 The metal surfaces of this 1978 made revolver retain 99% original blue with a light turn ring on cylinder and a hint of silvering at the left front of muzzle. The Pachmayr presentation grips rate very good plus with some dust staining and handling marks. The revolver is equipped with a Elliason rear sight and a patridge front sight. A nice 70's production Python overall. There is no box or papers.